One little hot dog sitting on a chair . . .
Two little hot dogs sitting on a chair . . .
One by one, more little hot dogs join the group until . 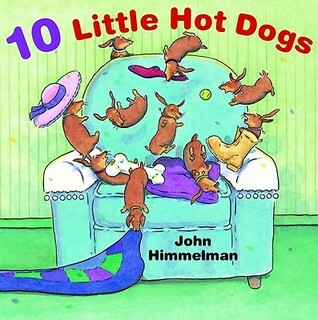 . . there are ten little hot dogs on the chair. They play and play until . . . they all fall asleep. But then, one little hot dog wakes up, and one by one, guess what the other hot dogs do? This funny picture book featuring artwork in watercolor and black pencil shows young readers how to count up from one to ten and back down from ten to one. This is the perfect read aloud book for dachshund lovers and their children. The story combines unique sounding words with counting that reinforces many objects parents want to cover with young readers. It is also something that a child will want to conquer on their own. As a dachshund owner, the author did dachshunds proud, capturing their spirit and life. I have a whole collection of dachshund related readers and this one will proudly join classics like Pretzel and Wiener Wolf! That cover is so cute. What a great idea for a book.